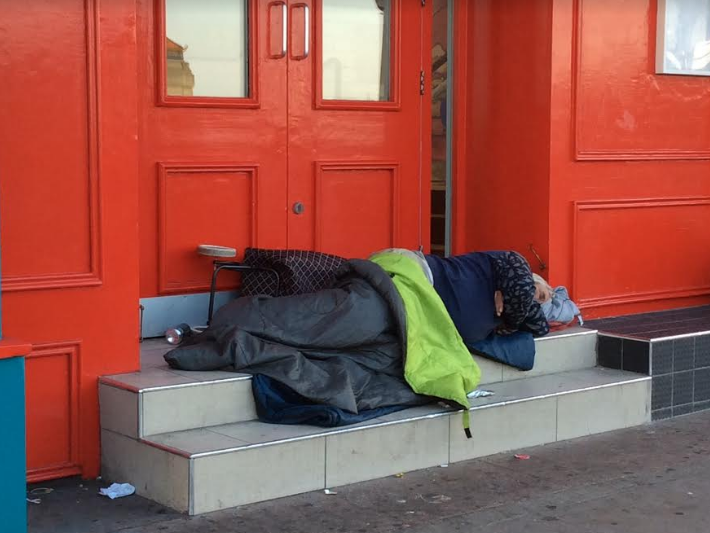 One in 69 people in Brighton and Hove are either in temporary accommodation or sleeping on the streets, making it by far the worst area in the south east for homelessness, a shocking new reports reveals today. Housing charity Shelter today said it was launching an urgent appeal after it calculated that homelessness in the south east has risen 20 per cent in just a year. And it warns that the true figures are likely to be even higher, as they do not include hidden homelessness. According to the latest available figures, in Brighton and Hove, 4,074 people are in temporary accommodation, and 144 are sleeping rough, a total of 4,218 out of a population of 289,229. The next worse area in the south east is Milton Keynes, with a total of 2,396 homeless people, and Slough with 1,117. All other areas are in three figures or less. Across the UK, Brighton is ranked 20th. Every other area in the top 20 is in London, except for Luton. The worst three areas are Newham, Haringey and Westminster with one in 25, 29 and 31 people homeless there respectively. Andy Winter, chief executive of Brighton Housing Trust, said: “These figures do not surprise me but they sadden me deeply. “Each one of these 4,218 individuals has uncertainty in their lives, and most will be experiencing the extreme hardship resulting from not having somewhere to call home. “In one of the richest cities in one of the richest countries in the world, these figures highlight the human tragedy of homelessness as well the need for a radical change in government policy. “We need a fundamental change in approach and a massive programme of council house building. “Merely building more top of the range flats and houses in Brighton will do nothing to help this appalling situation. That will merely fuel the inflationary consequences resulting from people selling up and moving down from London. “We are seeing people who have been in housing for a considerable amount of time losing their accommodation due to relation breakdowns and the ending of assured shorthold tenancies which has been the single greatest factor for people ending up homeless. Shelter’s chief executive Polly Neate said: “It’s shocking to think that today, almost 28,000 people in the South East are waking up homeless. “On a daily basis, we speak to people and families who are desperately trying to escape the devastating trap of homelessness. “A trap that is tightening thanks to decades of failure to build enough affordable homes and the impact of welfare cuts. “As this crisis continues to unfold, the work of our frontline advisers remains absolutely critical. Across London, a staggering one in 53 people are calculated to be homeless. This figure includes the number of people sleeping in hostels, which is not available on a local authority level. Shelter says the figures do not include “hidden” or unrecorded homelessness which is very difficult to quantify but known to be sizeable. A poll of 2,000 UK adults commissioned by Homeless Link in December 2013, found that 32 per cent of people have experienced homelessness (including sofa surfing and staying with friends) or know someone who has experienced homelessness. Fourteen per cent had experienced it themselves, 20 per cent knew someone else who had experienced it, 2 per cent said they had both experienced it and knew others who had. To support Shelter’s urgent appeal please visit www.shelter.org.uk or text SHELTER to 70080 to donate £3. Could bin arsonist have struck again? 4,074 people are in temporary accommodation – Council does not have a definition of “temporary” – can be days to years. People in temporary accommodation are not Homeless – they are in temporary accommodation. Homeless, as in does not have a home. Being housed in accommodation that could only last for days and therefore unable to apply for benefits and employment or keep any possessions is homeless. Left wing Shelter and the likes of Generation Rent blame landlords for the housing crisis, a bit rich from someone that has never actually housed anyone. Assured tenancy agreement for 1/3 years,but they are exiting.selling,evicting due to people like These supporting a tax on landlords turnover rather than profit ie . Section 24 ! This crisis is and will get worse. Everyone wants to bash landlords, due to a few rogue ones but there are far more rogue tenants! Enough is enough, let the local councils and government house all. Having lived in hove for the last 23 years I have to say upon walking though George street a few weeks ago I have never seen so many rough sleepers and people begging it is a disgrace to our government. and life can be a struggle for us all …..but my problems are small in comparison to these people ….The system is so wrong without work no home no address benefits ..
We can give them food a pound but that is not going to get them a home . people don’t become homeless in Brighton, they come to Brighton because it is easier for them to be here. i own a shop in the north lane and there are many young capable people who beg for spare change all day long to get their fix, and people give them change.. drugs is a huge part of the problem. We have the same problem here in Ashland Or. It’s a rich attractive town and so attracts vagrants (for want of a better word) the hand outs are quite generous, local government is very tolerant but has implemented local bylaws, with little or no success. The same public attitude is wholly to blame for the drug problem. Offer food and clothing etc. but handing out hard cash to addicts does nothing but to contribute to lining the pockets of pushers and dealers who fuel a growing problem. There is far too much to see and do in this vast wonderful world other than drugs. Don’t do drugs. If you’re gonna do something, do something worth doing!